For the “first time in a long time,” the Pacific Southwest District of the UUA hosted a retreat for young adults. Entitled “Encounter the Spirit,” sixty young adults and allies met together in the woods to worship, build community, and learn about social justice issues. I was there representing the UUA and leading a workshop on peacemaking and sustainable social justice. But I was also a participant in this excellent meeting. It was exciting to be back at Camp DeBenneville Pines, in my home state of California, with all these wonderful, passionate and compassionate people. I reconnected with old friends and made loads of new ones. My workshop on social justice for young adults was well attended and the energy was high. We talked about living our passions and performing random acts of kindness in the larger world. We also shared worship together. We sang songs under the stars. Among the ponderosa pines, we blessed each other’s hands. We did this by holding the hands of the person next to ourselves and giving prayers for strength and grace as they work for love and justice. Our covenant groups allowed us to know that there are other UUs our age who struggle with many of the same issues and share many of the same desires. And I found moments of cleansing solitude among a clear mountain stream. We also played cards, built puzzles, danced in a late summer thunderstorm, went swimming, and allowed ourselves to be silly. We told jokes, sang songs, shared stories and made friends. We discovered people who lived in our neighborhoods and shared the same church, but never went when we went. Most importantly we found we are not alone. Current estimates show that upward of 90% of people raised in the UU church leave the faith in their young adult years. 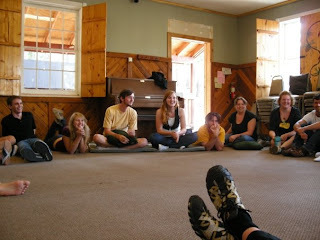 Retreats such as these can help nurish and grow the Unitarian Universalist young adult community. The creation of space like this gives people support. It welcomes new people into our religious community, honors those who have stayed, and beckons others to return. The myriad reasons are too vast to go into in this particular post. These could include the growth of new priorities and/or the discovery of new faith communities. But going to camp and seeing my peers was an amazing, life affirming, and empowering experience. By being together, we were able to remind each other why the Unitarian Universalist community is so wonderful. We were able to share, stretch, support and learn with one another. I came home feeling rejuvenated and empowered to work for justice knowing that there are others like me working for change. Plans for next year’s Pacific Southwest District Young Adult Retreat are already underway. 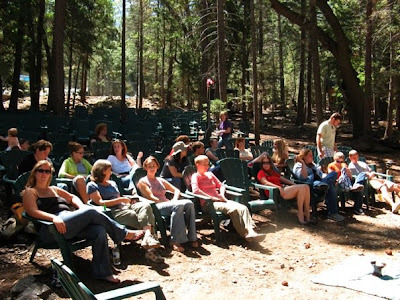 We will be gathering again at DeBenneville Pines from Sept. 4-7, 2009. For more information on next year’s event, please visit Connect UU.